Bocaditos LLC brings fresh Latin flavor to NECC’s Lawrence campus. On the corner of 420 Common St. in Lawrence, the Revolving Test Kitchen (RTK) is in partnership with NECC to help develop new restaurant talent in the city. Angie Jimenez, owner and chef of Bocaditos LLC, shares her experience so far and what’s new to come to the menu. Jimenez, a single mother of four, moved to Lawrence permanently from the Dominican Republic in the early ‘90s. Her passion for cooking began with her mother and aunt. “I helped them start their own little diner, about 20 some years ago, here in Lawrence. 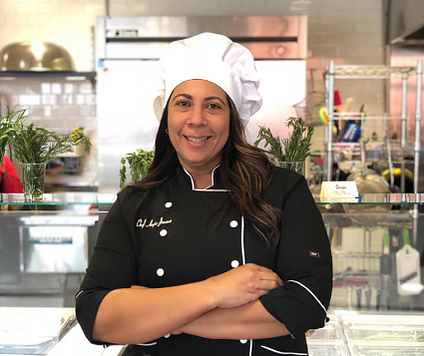 They ran it and I helped and that’s when I started to see I liked it.” “Then I watched the movie Julie and Julia and I really fell in love, so I decided to go to school after that.” Jimenez graduated from Le Cordon Bleu of Culinary Arts in Boston and truly began to pursue her dreams. “I was in the business (of catering) a while already but I wanted to have more techniques and learn more,” she says. Along with the new store location, Jimenez also owns a catering business under the same name, Bocaditos LLC. “I specialize in appetizers, but I’m trying like a fresh, homemade style with a Latin twist with Bocaditos” Jimenez says. “Mainly I use natural ingredients. I try to use it all fresh, as much as I can.” According to Jimenez, opening Bocaditos was not what she expected. “I’m used to catering and working with a client and customizing,” Jimenez recalls, “It’s more relaxed in a way.” “Even though I love creating food, when you come to a restaurant, you have to produce everyday. It’s difficult when you have to deal with so many components.” Jimenez had quickly realized what a large menu and small staff equal up to, a lot of stress. “I had so many things when I started, but you start seeing reality, it was too much, so I’m simplifying,” she says. Jimenez is perfecting her line of pastelitos, or empanadas. Her personal favorite, Jimenez mentions she makes her own dough and uses all nontraditional stuffing. “To me, it’s my pride and joy.” One of the five breakfast pastelitos includes the Early Bird: black forest ham, scrambled eggs and gouda cheese. Her six lunch pastelitos include The Caprese: fresh tomato, mozzarella cheese, basil pesto and reduced balsamic. Jimenez also wants to introduce a line of healthy style bowls with a Spanish twist. “I’m playing with the ingredients but the base is the same, quinoa, white rice or black beans with unique herbs and spices.” Bocaditos also offers homemade desserts and paninis. “I try to mix different cheeses or experiment with ingredients. I have an item with mango chutney and smoked gouda, those different flavors I really like”. Jimenez applied to RTK after a potential space in South Lawrence suddenly became unavailable due to the gas explosions that affected Lawrence, Andover and North Andover in September 2018. “I was almost ready to sign the lease when the gas explosion happened so I ended up with nothing,” Jimenez recalls.